One doesn’t bring posters of tauntauns, Aquaman, and President Ronald Reagan riding a velociraptor while firing a submachine gun to the Senate floor without expecting a little bit of controversy. If you are going to poke fun at the prevailing pieties of progressivism on a national stage, a little pushback should be expected. But what was surprising about the reaction to my speech on the Green New Deal is which chart garnered the most vehement anger. It wasn’t Reagan riding a dinosaur or Utah Gov. 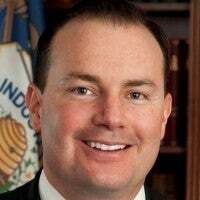 Gary Herbert battling tornado-propelled sharks or House Speaker Nancy Pelosi asserting that the resolution’s own supporters don’t know what’s in it. 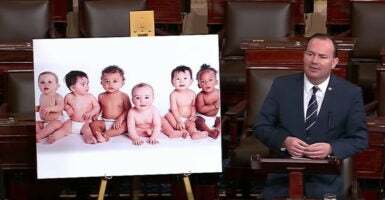 No, the most controversial poster of the 14-minute speech turned out to be a simple image of six smiling babies. Why such an aggrieved reaction to such a heart-warming image? I’ll let Emily, a 28-year-old woman who talked to FiveThirtyEight from Spokane, Washington, explain. We have physical proof that we cause a lot of harm to the planet, and I think the statistics show an imperative to reduce the footprint of our population, which has grown so fast. I think that having children can be immoral for a lot of reasons. Emily and the authors of the Green New Deal are not the first people to believe that bringing children into this world is a morally questionable act. Quite the opposite. The belief that the human population must be limited and controlled by government is a founding principle of the environmental movement. As far back as 1798, when scholar Thomas Malthus published “An Essay on the Principle of Population,” utopian-seeking elites have made the case that human population growth must be controlled in order to ensure a sustainable society. These well-intentioned beliefs led to policy changes like the Corn Laws, which raised taxes on grain imports to the United Kingdom. Opposed by classical economists like David Ricardo, who warned that such laws would make food more expensive, the Corn Laws were eventually repealed after they worsened the Great Famine in Ireland, when over 1 million people died of hunger. Fast forward to 1968 when American biologist Paul Ehrlich published “The Population Bomb,” a book arguing that the government must take urgent action to limit population growth or humanity would face imminent ecological disaster. Ehrlich’s gloom-and-doom prophecies were quite popular with a segment of the American public as the book went on to be a best-seller. But many economists pushed back—including University of Maryland professor Julian Simon who believed that humanity, if left free to innovate, could find new ways to make limited resources provide for an ever-expanding world population. Simon and Ehrlich even made a bet testing their beliefs in 1980, picking five commodities to track over a 10-year period. In 1990, Ehrlich was forced to admit he lost, mailing a check to Simon in the amount that the commodities had fallen in price over that 10-year span. Since that time, the earth has added billions more people, all while global poverty continues to fall. What Malthus, Ehrlich, Emily, and the authors of the Green New Deal keep failing to understand is that human consumption and production patterns are not static. Since the beginning of our species, humans have constantly been innovating and changing the world around them. In fact, it is our ability to function as a collective learning brain that sets us apart from every other animal on earth. The most obvious way the size of a group can matter is that more minds can generate more lucky errors, novel recombinations, chance insights, and intentional improvements. … So, bigger groups have the potential for more rapid cumulative cultural evolution. Now the size of a population is not the only thing that matters. A society must also have in place institutions, cultural norms, and a legal framework that encourages experimentation, innovation, and creativity. And here is where the failure of the Green New Deal as a serious response to climate change is the clearest. Instead of fostering an open-ended approach to addressing climate change, it demands top-down policy programs that forbid certain avenues of exploration, like nuclear energy, while also tacking on irrelevant policy goals, like universal health care, that have nothing to do with the issue the authors of the plan claim is so urgent. This article has been modified to show that Emily was speaking to FiveThirtyEight.